Australian Sustainable Food Company and its suppliers utilise world leading sustainable accreditation to provide our customers the confidence in the quality and ethics of the product they are buying. Our approach to delivering sustainable and high quality products is based on the 3 pillars of financial, environmental and social sustainability for all our stakeholders. We have a particular focus on maintaining and improving the soils and environment in which the produce and animals sourced for our markets are farmed. We strive always to ensure that future generations will benefit from our actions in terms of improvements to the land and soils. 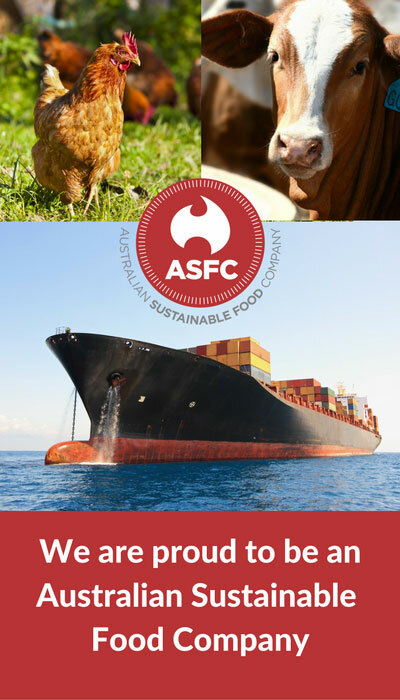 We use world leading Sustainability accreditation systems to guarantee that ASFC products are a premium source of protein, derived from on-farm and processing practices that are healthy and sustainable in the long term. As our name suggests, we focus on food products that are farmed and manufactured in clean, safe and sustainable ways. Our cattle farms have sustainability accreditation which means that our customers know that our cattle are farmed and processed on properties that use internationally recognised sustainable farming practices. Reduce the environmental impact on the farming properties through reduced water consumption, improved pasture, topsoil CO2 sequestration, reduced noxious weed prevalence and improved soils. Increase benefits to the farming communities where our properties are located. More customers happy with your company’s products and food. ASFC is also able to work with suppliers to source Certified Organic food and beverages such as organic beef, wine, seafood and beer. Organic products are premium products that represent the ultimate in healthily produced food. Like sustainably produced products they are grown using a whole of environment and ecosystem approach, but they go further in eliminating the use of synthetic chemicals, fertilisers or genetically modified organisms when they are grown and processed. Organic is an innovative method of farming and production - and is increasingly being recognised as being on the leading edge of food technology.